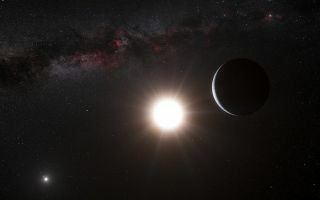 An exoplanet could orbit in the habitable zone of our neighboring binary star system, Alpha Centauri, as depicted in this illustration. Alpha Centauri A is the larger star, and B is the smaller one. A new initiative called "Project Blue" aims to spy on our interstellar neighbor, Alpha Centauri, to capture an unprecedented visible-light image of any Earth-like planets that might orbit there. The project, which hopes to launch a lightweight telescope into Earth orbit by 2019, was announced today (Oct. 11). "There is an extremely high level of urgency and desire on the part of the astronomical community to get out there and find exoplanets that we can actually image and characterize around nearby stars," said Jon Morse, CEO of the BoldlyGo Institute, one of the project's leaders. "We know we need to go to space for many of the hardest measurements to make, especially to directly image small planets around nearby stars that are Earth-class terrestrial planets, and the scientists all have this idea of finding Earth 2.0," Morse told Space.com. "Let's take that Pale Blue Dot image around another star." Morse was referring to a famous image, taken by NASA's Voyager 1 spacecraft in 1990, that showed the Earth from afar as a small, faint, blue-tinged pinprick. Our first direct view of a planet around Alpha Centauri by telescope would look similar, he said. Along with the BoldlyGo Institute, a New York-based nonprofit organization dedicated to privately funded space missions and research, "Project Blue" is led by Mission Centaur, a new nonprofit devoted to searching for planets around Alpha Centauri. The SETI (Search for Extraterrestrial Intelligence) Institute and the University of Massachusetts Lowell are also collaborating on the project. A simulation of what data from Project Blue might look like — a blue dot indicating the distant light of a potentially Earth-like planet around Alpha Centauri; the first such direct view. Funding is to be determined — "We will have, hopefully, some further announcements that we're not quite ready to talk about," Morse said — but the project will stay low-cost by using commercially available launch systems and instrumentation. Funds for the project, which could cost between $10 million and $50 million over its lifetime, will come from community involvement, sponsorships and other agreements, he said. The project would consist of two high-altitude balloon flights testing similar instruments, with NASA's support, and then a satellite with a refrigerator-size telescope/instrument package, which would be in space between 2019 and 2022 collecting data. "The approach here is not taking a very expensive project and removing things you don't need, like sculptures do," Project Blue team member Supriya Chakrabarti, an astrophysicist at the University of Massachussetts Lowell, told Space.com. "We're trying to start with a fairly low-cost system that we have proven, and then try to see what we need to make this thing tailored for a very specific task as fast as we can and as low-cost as we can." Chakrabarti is the director of the Lowell Center for Space Science and Technology at the university. When it comes to Alpha Centauri, "We don't need a big giant telescope that's at least a meter [3.3 feet] in size or larger-type project that NASA's currently doing, like the WFIRST mission — we're able to keep this telescope to roughly half a meter, and we can still explore that habitable zone," Morse said, referring to the Wide Field Infrared Survey Telescope, a mission that NASA aims to begin in the mid-2020s. But what of Proxima Centauri, the red dwarf star slightly closer to Earth where researchers found a planet whose minimum size is near Earth's in August? That star is much dimmer and smaller than the sun, and the habitable zone around it — where liquid water can exist — is therefore too close in to be distinguished visually from the star, the researchers said. And the planet's surroundings are much different than Earth's because of the star it circles. Researchers detected the planet around Proxima Centauri by noticing the tiny wobbles in the star caused by the planet's gravity, and most observations of worlds outside our solar system rely on similar indirect evidence that a star harbors orbiting passengers. NASA's Kepler space telescope, for instance, detects the slight dimming that occurs when a planet passes across a star's face. Project Blue, instead, would rely on direct imaging — essentially photographing the planet with a powerful-enough telescope. "It's a very daunting challenge [because] we're trying to image the planets in the visible light, the light that we can see with our eyes," Chakrabarti told Space.com. "The planets are a billion, or maybe 10 billion, times dimmer than the stars themselves. Certainly, our sun is 10 billion times brighter than our Earth. "What you have to do is devise an instrument that could selectively turn off the light of the star, and not do anything to the light of the planet — or something only minimal," Chakrabarti said. He compared this device to the Deluminator in the "Harry Potter" series, which selectively darkens nearby streetlights. Rendering of the telescope Project Blue aims to put in space to search for planets around the nearby star system Alpha Centauri. Space.com reported on a talk last year by Ruslan Belikov, an astronomer based at NASA's Ames Research Center in California, about methods for imaging Alpha Centauri to search for a planet. This effort comes with unique challenges, Belikov said, because of the potentially complex orbit of a planet around two stars and the need to block out the light of both stars to spot any planetary specks. Morse said he hopes to use similar methods — described in Belikov's and other studies — to use deformable mirrors and star shades to cancel out the stars' glare. And the rest of the technology, like that required to hold the telescope steady enough in space to image the star system, has made rapid strides lately, Chakrabarti said. Such advances should make Project Blue possible on a smaller budget than ever — and it's a project that would be extremely difficult to do on more general-purpose telescopes, like Hubble, team members said. "The opportunity here is the confluence between the technology development that's been occurring, the scientific urgency, not only for exoplanets in general but the announcement of a super-Earth-class planet around Proxima Centauri in the same stellar group," Morse said. A rendering of the satellite assembly that would carry Project Blue's telescope to space to try and directly image Alpha Centauri. A rendering of the telescope and satellite Project Blue would launch into space to search for planets orbiting Alpha Centauri. Because of the target's nearness to Earth, the telescope and instruments can be around the size of a refrigerator. The project is a gamble, the researchers said, and requires making fiendishly difficult measurements. But it's possible to do Project Blue relatively inexpensively due to the stars' lucky location, and it'd have the potential to reveal an Earth-like planet very close to home orbiting a star like ours, even if in a much more complicated star system. Kepler's observations suggest that pretty much every star in the sky hosts at least one planet, and alien worlds have been found in a number of two-star systems. So there's a good chance Project Blue would find something, Morse said. "The good thing is that we have two sun-like stars, and therefore two chances," he said. "Some people want to put the probability of finding at least one planet in one of the systems as high as 80 percent or more." If all went well, they'd be poised to catch sight of blue and greenish wavelengths — just enough to tell if any planet around Alpha Centauri is indeed a "pale blue dot" like Earth viewed from afar. Just a visible-light detection can tell researchers about the planet's mass and a little bit of its composition — reflectivity could indicate clouds, for instance. And the next steps of research could characterize the planet further. "Once something like this is found, all kinds of other people would look at it in different colors — infrared, which could then give you some idea of temperature and so forth," Chakrabarti said. "We're taking the first step. After that, there will be a lot more detailed investigations, which will tell us a lot more." The next steps, then, would be to characterize the planet, determine what it's made of and what it's like using other instruments and then — maybe — to send a robotic emissary to get an up-close look. Editor's Note: This article was corrected at 11:30 a.m. EDT to remove a reference to University of Arizona, who is not a partner on Project Blue.